Welcome to the Shepherds Grove Boston Terrier Gifts page. You're in the right place if you are looking for memorable Boston Terrier Merchandise. We offer a variety of pottery shapes decorated with Boston Terriers, all handmade for you at our Eureka, CA, studio. Our Boston Terrier items include Boston Terrier mugs, wine stoppers, dipping bowls, sugar bowls, creamers and treat jars. Newitems are always being added. You can choose from the available Boston Terrier coat color or have the artwork customized to reflect your dog's colors and markings (a small art fee applies). Regardless of which version you choose, we believe you will be very happy each and every time you see or use your Boston Terrier items from Shepherd's Grove. All of our Boston Terrier Merchandise is made for you when you order and can take 2-3 weeks to get through the whole process, which includes three kiln firings. Our original Boston Terrier artwork is made into decals in-house, and are then applied to our hand painted stoneware and fired at 1570 degrees Fahrenheit. The decal becomes fused and one with the glaze, rendering it as strong as the glaze surface itself. What does this mean for you? That your Boston Terrier items will be durable (because of the stoneware clay body) and remain vibrant and beautiful for years and years or dishwasher and microwave use. Why are Boston Terriers so popular? That question is easily answered once you take a look at them or get to know one. Their inquisitive faces, with their big eyes, draw you in and then their loving and affectionate personalities seal the deal. Our own home is filled with the large presence of Mr. Dante, our German Shepherd, but we feel very lucky to have Boston Terriers among our acquaintance. 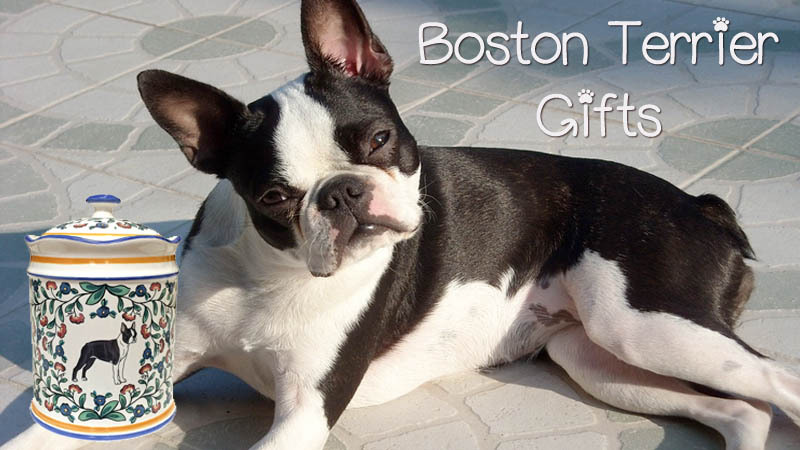 And are very happy to celebrate them here at Shepherd's Grove Studio with our Boston Terrier Gifts.